Fairfield Theatre Company hosts members of the brother-lead rock band in July and August. The Black Crowes performed at The Klein Auditorium in Bridgeport, CT in Sept. 2009. Since then, the brother-lead southern rock band has disbanded, but the Fairfield Theatre Company has the next best thing lined up at their two venues. Brothers Rich and Chris Robinson both headline their own shows later this month, as does former Black Crowes guitarist Jackie Greene. 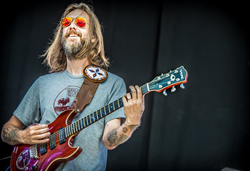 The Chris Robinson Brotherhood began in 2011 as the singer’s extension of the multi-sourced, open-ended musicality that is part of the Crowes. With influence on Chris’ original music, the Brotherhood fully embraces the Grateful Dead/jam band spirit that anything goes and no song is finished until the musicians decide it has run its course. They perform a sold out show on Friday, July 29 at The Warehouse. Just three nights later, expect airy, southern rock ‘n’ roll when Rich Robinson rolls into town. He’s calm, cool, and collected, with lyrically pleasing songs and smooth rhythm. It is sure to be a fun night Tuesday, Aug. 2 on StageOne. "Rich Robinson brings back not only roots-rock accessibility, but the complexity and originality that transformed the Black Crowes into a band that mattered,” Paste Magazine stated. Robinson has returned to Fairfield each August since 2014, and this year is no exception. Robinson just released his new record “Flux” on June 24, which “showcases an eclectic range of tempos, tones and tunings, all delivered with the same swagger Robinson first made famous with his brother, Chris Robinson, in the Black Crowes,” according to Guitar World. To kick off this Robinson brother week at FTC, Jackie Greene Band performs Friday, July 22 in The Warehouse. Greene joined the Black Crowes in 2013 and continued until their final days in 2015. Glide Magazine praised Greene’s Black Crowes guitar playing by saying, “Not only does Greene add another dimension with his mandolin playing, but he’s delivered crushing guitar solos in lead-heavy songs such as Jealous Again, Wiser Time and Morning Song.” He returns to The Warehouse following a sold out February performance. Visit http://www.fairfieldtheatre.org for samples of the music and ticketing information. Fairfield Theatre Company is a highly-acclaimed nonprofit performing arts organization located in the heart of downtown at 70 Sanford St., Fairfield, Connecticut. FTC presents over 300 performances and concerts each year featuring outstanding national talent on FTC’s StageOne in Fairfield, The Warehouse at FTC in Fairfield, the Klein Auditorium in Bridgeport, and the Norwalk Concert Hall. FTC’s venues are widely recognized as being the best places to see live performances in the region. FTC is dedicated to providing the highest quality arts, entertainment, and educational experiences to the communities we serve.